This moist, oil-free vegan persimmon bread is made with 100% whole wheat flour and no refined sugar. It’s the perfect winter dessert! It’s persimmon time again, or at least it was, very briefly, in my parents’ yard in Louisiana. I got an email a couple of weeks ago from my dad saying that if I wanted persimmons, I’d better come get them because they were rapidly going from ripe to overripe to compost. He’d pick what was left on the trees and hold them for me, but they wouldn’t last long. So last weekend I made a quick trip down to pick up my persimmons, along with boxes full of the citrus fruits–Meyer lemons, naval oranges, satsumas, and calamondins–that were just beginning too ripen. My kitchen now looks like a fruit stand! Fortunately, the citrus will keep, but many of the persimmons were at the use ’em or lose ’em stage. I’ve been eating them every chance I get, but since I’m the only one in my house who likes them, I knew I had to start cooking with them. My parents mentioned that they had been substituting them for banana in banana bread, so I decided to give that a try and adapted my Cherry-Walnut Banana Bread recipe. Before I get to the recipe, let me say a word about persimmons. 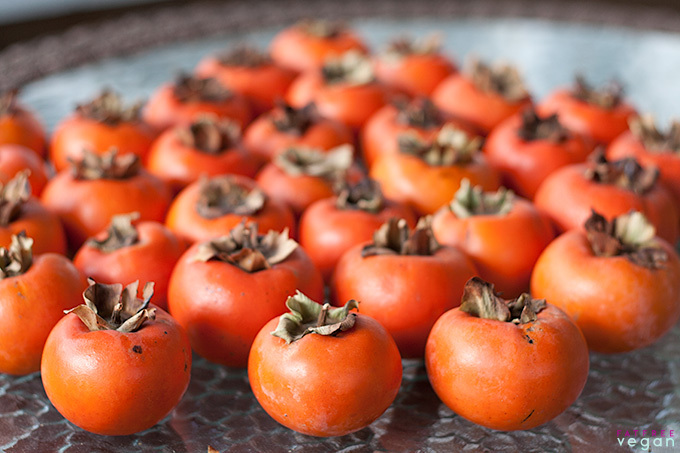 As I’ve written before, most of the persimmons we get in the U.S. are of two types: the acorn-shaped Hachiya, which needs to be so ripe that it’s practically squishy when you eat it or else it will be so astringent that your mouth will pucker, and the more squatty-shaped Fuyu, which is sweet and delicious even when the fruit is still firm. Conventional wisdom says that Hachiyas are the ones you cook with, but I’m going to tell you a secret: If you let Fuyus get ripe enough, they will get soft just like Hachiyas and you can cook with them, too. The persimmons I got from my parents are Fuyus, and they’re delciously sweet whether they’re firm and crisp or soft and mushy. I used the soft and mushy ones for this bread, about 6 of them. They had seeds, so what I did was cut them in half and scoop out the seeds and flesh with a grapefruit spoon. I tossed the seeds into a separate bowl and didn’t even try to get off the flesh that clung to them–that’s just too much work. It’s a pretty messy job, so don’t take your cutting board and bowls into the family room and watch TV while you’re doing it, or you’ll get persimmon pulp all over the coffee table and your daughter’s homework. Not that anyone would do that, of course! The finished bread was amazingly moist and cake-like, even though I used all whole wheat flour (the white King Arthur kind) and no refined sugar. The persimmons gave it a lovely orange color, very fall-like, and the taste was mild and lightly sweet. The whole family loved it, devouring it in one day without any margarine or spread. The next time I make it, I may add a little cinnamon and cloves to spice it up, but then, I’m the spicy type. I baked this bread in a small, silicone bundt pan, but you can use a regular bread pan, preferably a smaller sized one, if you oil it lightly. Low-fat quickbreads like this really benefit from being allowed to cool completely, which is why they often taste better the next day. The crust, which is chewier than breads with oil, will gather moisture and softness over time. Nutrition info below is for bread made with 1/4 cup walnuts. Without walnuts, deduct 16 calories and 1.58g fat per serving. 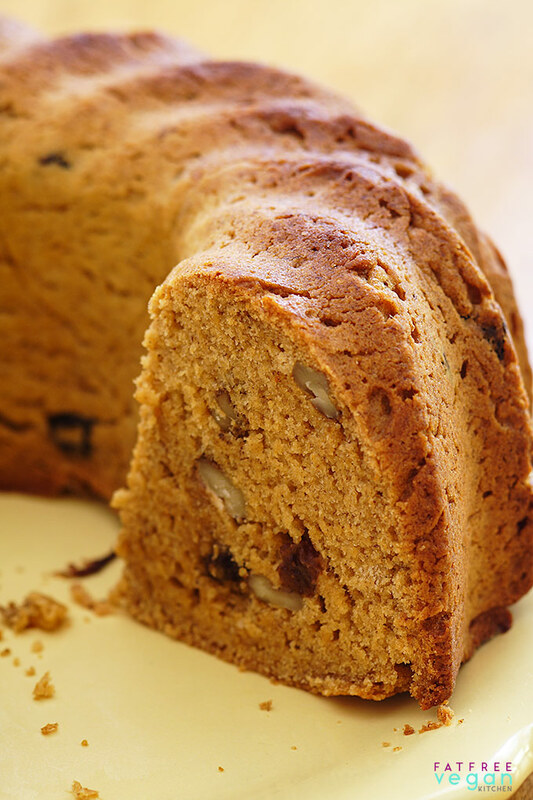 Or try my other persimmon bread, Fall Harvest Fruit Cake, made with persimmons and apples. 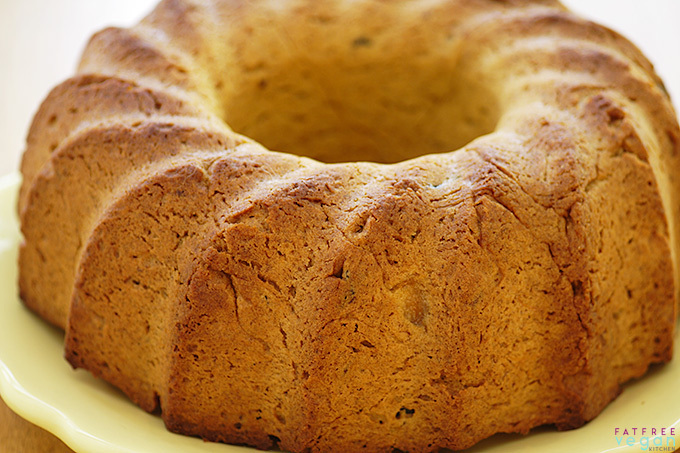 I want to try this and I love bundt cakes but I don't have a bundt pan. What kind do you recommend? Hi! 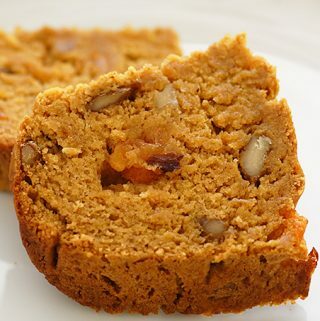 I made your persimmon bread…..I was skeptical about it being complete without the eggs, but it turned out GREAT!!!!!!! I never ate a persimmon before, and tasted them while I was cutting them, they r yummy. The bread is a winner. This recipe is really good- thank you! Helped me finish up the last few persimmons I had. But now I’m wishing I had more of the darn things so that I could make and freeze another loaf of this delicious bread for later. hmm Can i use a no calorie sugar instead of the agave nectar?? If it’s one that substitutes 1 to1 for sugar, you can try. You just need to use the same amount as the agave in the recipe. can i replace the agave nectar with honey? You can use any liquid sweetener (sugar) instead of the agave. I haven’t baked with papaya, but it sounds good! Made some persimmon bread from your recipe with a little bit of substitutions. Came out very tasty but a bit too moist. Do you have any suggestions on how to convert a sweet bread recipe (like the persimmon bread) into one that would work to make muffins? 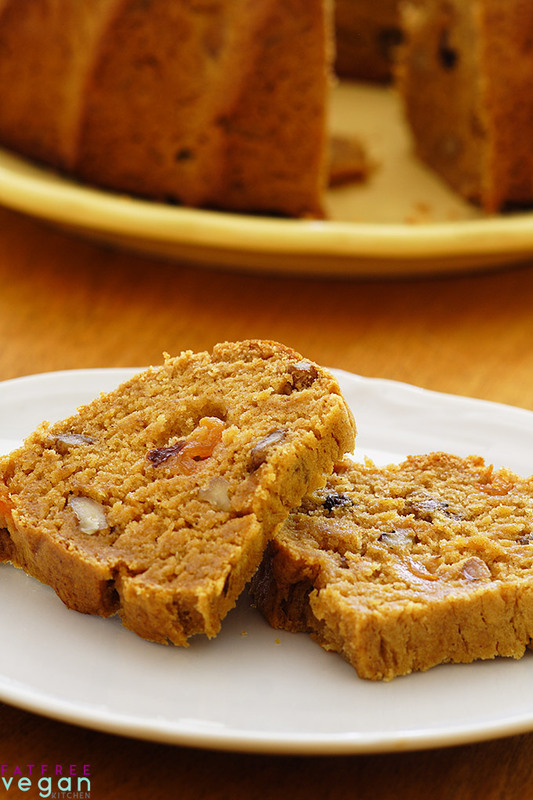 Will fuyu persimmons bread or cake freeze? Yes, the bread should freeze just fine. This is pretty good for no oil,butter,milk or eggs. I had extra persimmon puree so skipped the oil/applesauce. For the sweetener I used half agave and half date syrup/paste. I was a little concerned whether or not it would hold together so I did add 1 tsp xanthan gum. Turned out plenty sweet enough and extra moist (almost gooey). Persimmon is a very mild flavor so the bread tasted faintly nutmegy with no real persimmon taste. All in all, a decent alternative to the standard banana bread. It doubled well. how does one get the persimmon pulp? Peeling? Steph, I go into detail about that in the post. Basically it involves scooping the pulp out of the halved persimmons. I have wanted to make this but cannot stop eating the persimmons and never have enough. I cannot eat the hachiya kind, so I always end up digging into the fuyus before they are even soft and don’t ever have enough for this or the sorbet! I’ll keep dreaming. Just made this recipe and was in love at first bite. I think I used too large of a buddy pan though so I will use a smaller one next time so I can get the beautiful shape. I just cut the tops off my persimmons and sliced them in quarters, threw them in the magic bullet and voila! I just tried this recipe, I used oil instead of applesauce and coconut sugar (1:1 as regular sugar) instead of agave nectar , as was recommended. However, the batter was very dry and crumbly. I added a bit more of persimmon to moisten it up, but after baking it came out dry and like a biscuit. I believe that the sugar +2tbsps of water is not enough liquid to replace the agave nectar. Very sad about the results, besides the oil, I just wasted very good quality ingredients. I just made this bread today, except I subbed 2 cups brown rice flour for the whole wheat flour to make it gluten free, and omitted the oil completely. I just added a but more persimmon and it worked great!!! About how many fuyu persimmons would make 1 1/4 cup mashed? i can’t wait to make this! i ♡ persimmons. Probably about 6, depending on their size. Be sure to let them get very soft first. Hope you enjoy! I plan on baking your bread recipe but want to make it savory. Would that work or would it turn out bitter? Don’t know if persimmons are sweet, bitter or ?? Sylvia (commentor) says they’re yummy, does that mean sweet? Persimmons are extremely sweet, so I can’t imagine a savory version being very good. Sorry! I made the recipe as written except for the walnuts, which I didn’t add. I used ripe hachiya persimmon pulp. The resulting ‘batter’ was very dry and not ‘pourable’ as the recipe states. I patted the batter into a bread pan. The bread came out too wet even though I baked for 60 mins. The taste was okay, although I would add cinnamon. My thought is perhap the other type of persimmon works better in this recipe. Had the same experience with the Hachiya persimmons–bread was too wet and needed cinnamon. I wish I had heeded your advice! I made this recipe today. I changed a few things: Used spelt flour because thats what I had on hand, replaced the apple sauce with coconut oil, added 1/2t of cinnamon, used maple syrup in place of agave, and I had extra persimmon pulp so I reduced the amount of maple syrup. The bread turned out lovely. It was very moist – in some spots it was pudding like,, likely because of the increased persimmon pulp. Its not too sweet because I only used 1/4c of maple syrup. This was really good. I subbed maple syrup for the agave and I dried pineapple tidbits for raisins. Heed this warning, this recipe doesn’t work well with the Hachiya persimmons (those you usually would want to bake bread with). I followed the recipe exactly and ended up with a bread loaf so wet no amount of baking was going to save it. (Some reviewers referred to it as pudding-like). My guess is that the structure of the two kinds of persimmons is different. Also, if you are using ground nutmeg (not fresh), you should use 1/4-1/2 as the flavor is stronger. Overall waste of ingredients. I LOVE Hachiya persimmons and use them when they’re pretty much mush, as that’s when they are superbly sweet and flavorful. I wash them well, then let them ripen, which can take weeks, sometimes. I’ve not found that placing them in a paper bag really speeds things up a lot. When I have too many ripe Hachiya persimmons at once (what a delight! ), I freeze them intact. They thaw and are almost indistinguishable from fresh ones. I doubt this would work for Fuyus, as the texture would probably be affected. A great way to preserve the bounty!